Hortus Camdenensis | Sparaxis galeata Ker-Gawl. Cormous perennial, leaves often prostrate, flowers 4-7 per spike, cream and yellow with mauve markings. To 35cm. [CECB, RHSD]. 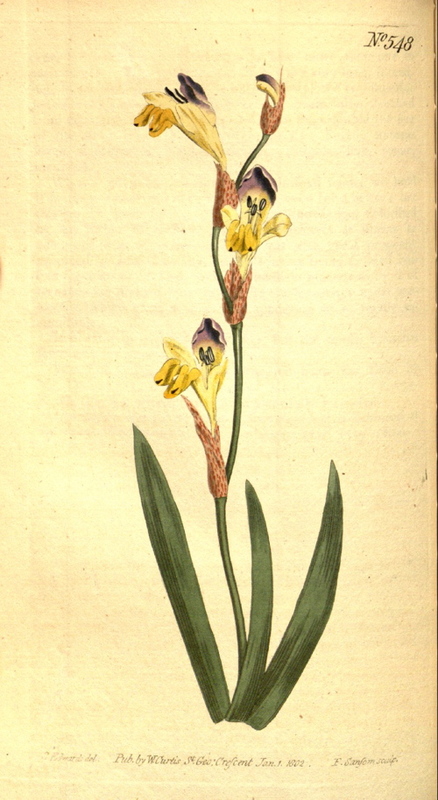 ‘Many of our readers will doubtless be surprised to see this plant [Ixia bicolor] ranked under Ixia, where indeed, as the essential character has hitherto stood, it can claim no admission; but, while grandiflora and its relatives are suffered to remain, this cannot be excluded without giving a shock to natural affinity. […] For an opportunity of presenting our readers with a figure of this very rare species, we are indebted to Edward Woodford, Esq. of Vauxhall, from whose rich mine our work is adorned with many a gem. It is omitted by Gmelin, in Syst. Nat. and by Martyn, in Mill. Dict. Was introduced to the Kew Garden by Mr. Masson, in 1786. Flowers in March. Scentless. May it be a hybrid plant?’ Gawler then proceeds to review the genus Ixia and what he considers aberrant species. In a note the Editor adds: ‘Convinced of these imperfections in the present arrangement, Mr. Gawler has been led to propose the forming of a new genus, under the name of Sparaxis.’ [BM t.548/1802]. Only listed in the Addendum to the 1843 catalogue. In Macarthur’s possession as Synnotia bicolor by 1843 as specimens were sent to William Macleay in October of that year. [MP A2948-3]. Gladiolus galeatus Burm.f. = Gladiolus alatus L. which see.